Be the first to share your favorite memory, photo or story of Eugene "Gene". This memorial page is dedicated for family, friends and future generations to celebrate the life of their loved one. He was the loving husband of Donna (Gray) Ehrgood. They were married 44 years. to whom he married on May 11, 1974. Born on May 15, 1951 in Reading, PA he is the son of Evelyn Bouchard, of West Lawn and the late Aimee Bouchard. Gene was a 1969 Graduate of Wilson High School. 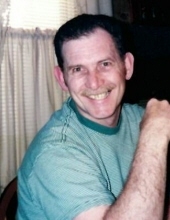 Gene was a volunteer firefighter for the City of Reading and enjoyed baseball and bowling. Most of all, Gene loved his wife, daughter and grandchildren. In addition to his wife, , Gene is survived by his daughter Shannon E., wife of Christopher Celmer; granddaughter Rayanna Celmer; grandson Riley Celmer. Eugene is survived by four brothers; Bradford Ehrgood, Dennis Bouchard, Michael Bouchard and Robert Bouchard. Services will be private at the request of the family. The Sanders Funeral Home and Cremation Services, Inc., 1501 North 11th Street, Reading, is in charge of the arrangements. In lieu of flowers, contributions may be made in Eugene’s memory to the charity of your choice. Online condolences may be made at www.sandersfuneral.com. To send flowers or a remembrance gift to the family of Eugene "Gene" K. Ehrgood, please visit our Tribute Store. "Email Address" would like to share the life celebration of Eugene "Gene" K. Ehrgood. Click on the "link" to go to share a favorite memory or leave a condolence message for the family.